The novel is fundamentally an exploration of Rand’s philosophy of rational selfishness, the belief that all virtue and vice is basically an expression of reason and that we are at root motivated by selfish impulses. To think otherwise is naïve and dangerous. Rand is at great pains to run counter to Marxism and the idea that selfishness is in reality an expression of a mode of culture, most specifically capitalism. Rand would have us believe that the great movements of history were driven by those who selfishly follow their rational tendencies. 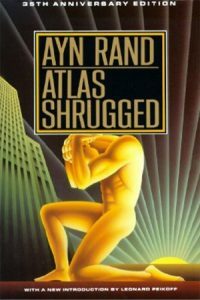 Nevertheless, Ayn Rand’s Atlas Shrugged remains influential. The American Libertarian Party draws much of its ideological foundations from the philosophy of Ayn Rand and this novel in particular. Many leaders in business have been influenced by the novel since it clearly bolsters a set of beliefs which reinforce their own choices. Numerous attempts have been made to adapt the novel for film and nearly all of them have become bogged down in finance and production problems. Rand herself, who was once a Hollywood screen writer, attempted to write a script adaptation. She died leaving it unfinished.